For more than 50 years, Jay Lieberfarb saved people from the waters off of Jones Beach. But three years ago, Nassau County told him he wasn’t good enough to save people from the Eisenhower Park Aquatic Center’s swimming pool. The lawsuit was actually brought against the county by the U.S. Equal Employment Opportunity Commission. Lieberfarb will receive full back pay, but Nassau County does not have to rehire him. He said he doesn’t want the job back anyway, and is happy with his new position — working as a lifeguard at Hofstra University’s pool. Lieberfarb, now 74, said the issue began when Nassau County ordered its lifeguards to take a swimming test, which he said was unexpected. Lifeguards had to swim both 50 meters and 200 meters within a certain time. He did not meet the time requirements and was told he could take the test again the next week. He was suspended without pay, and given one week to get ready to take the test again, he said. Lieberfarb passed the 50 meter test, but strained a calf before doing 200 meters. Again, he said he was given another week and was told to produce a doctor’s note. Two days later, he was fired. Lieberfarb said he was able to produce records that showed that no other lifeguards were penalized as a result of failing a test, and said he believes that is what put his case over the top. Nassau County Attorney John Ciampoli said the settlement admits no wrongdoing by the county. He said the county was willing to give Lieberfarb back pay, but did not want to rehire him because of the failed swim test, “which is really not a good thing for lifeguards,” Ciampoli said. Ciampoli added that county officials are committed to ensuring that all of its employment practices follow the law, and that employees and supervisors are properly trained. When Lieberfarb was a member of the swim team at Adelphi University, many of his teammates were lifeguards at Jones Beach. They recommended it to him as a summer job, so Lieberfarb began working there in 1956. He moved up the ranks, and eventually became a captain. “Little did I know that 56 years later, I’d still be working as a lifeguard,” he said, noting that he made hundreds of rescues during his half-century at Jones Beach. 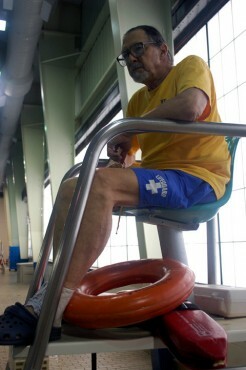 A retired school teacher in New York City, Lieberfarb said he plans to remain a lifeguard as long as he continues to pass his certification tests. He added that he is glad to now have the discrimination suit settled and behind him.